(John Tlumacki / Globe Staff) Kevin Youkillis walks off the field after hitting the last out of the game in the ninth inning. The Red Sox lost to the Royals, 8-6. It’s hardly the end of the world when on a crisp July night with a Northern California feel, the Red Sox lose sole possession of first place in the American League East for the first time since June 23 by virtue of an 8-6 loss to the Kansas City Royals at Fenway. From the moment the Sox took the field last night they knew their exclusivity was at stake after the red-hot Yankees completed a sweep of the Twins in Minneapolis yesterday. However, with the Royals (12 games under .500 entering the series) in town, it seemed the stars were aligned for the Sox to finish the first half strong. So much for the stars. The Red Sox, who led the AL East by five games June 23 and now share first-place with the Yankees, had no trouble scoring early against Luke Hochevar, who was making his first Fenway start since being on the negative side of Jon Lester’s no-hitter May 19, 2008. The problem was they couldn’t put him away. The problem was Brad Penny failed to get into the sixth inning. And the biggest problem was the bullpen (which boasted an AL-best 3.12 ERA entering the game) couldn’t hold Penny’s 4-3 lead. 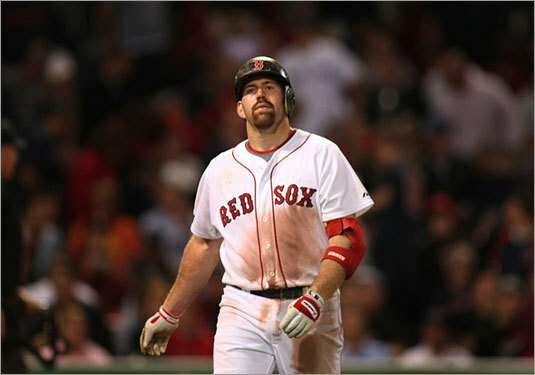 According to Jason Bay, the Red Sox haven’t given away first place, it’s the Yankees who have earned their spot. Ortiz knows there’s still plenty of baseball left. Penny, who came in with nine quality starts, kept his mates in the game. The Sox were 9-7 in his starts, not bad for a No. 5 starter. But while his velocity continued to peak at a lofty 97 miles per hour, there wasn’t much else. Penny lasted only five innings and received a no decision after throwing 97 pitches that were thrown hard but hit harder. He left with a 4-3 lead, but the Royals scored four in the sixth against relievers Manny Delcarmen and Justin Masterson. What was discouraging was the 4-0 lead after three became a 4-3 lead after four. Penny started leaving his fastball on the fat part of the plate and KC hitters weren’t missing. Miguel Olivo and Alberto Callaspo drove in runs and another run scored on Jason Varitek’s overthrow to second base on Olivo’s stolen base. Penny rebounded with a 1-2-3 fifth, but those were loud outs. Dustin Pedroia eased the anxiety somewhat with a solo homer over the Monster in the fifth, stretching the lead to 5-3 and manager Terry Francona lifted Penny for Delcarmen. A big nemesis was Callaspo, who doubled in his second run off Delcarmen with two outs in the sixth. After Delcarmen left, Masterson allowed a bloop single to center by Ryan Freel for another run and that was followed by a two-run homer to right by David DeJesus, giving the Royals 7-5 advantage. Willie Bloomquist extended the lead to 8-5 when his triple off Ramirez delivered Freel in the eighth. The Sox made waves in the eighth, loading the bases with one out after Juan Cruz (who entered having retired 18 straight batters) walked Ortiz and Bay before allowing a long sacrifice fly to center by Mark Kotsay that scored the sixth run. The Sox couldn’t do anything after that as Nick Green took a called third strike against closer Joakim Soria to end the threat. Soria retired the Sox in the ninth to preserve the win.